I woke up this morning....and I felt completely normal. I realize I am probably jinxing myself in the process but I don't care. Why? Because after I made myself a delicious breakfast, I walked out the door to go to work and it.was.beautiful. It was fall. I almost ran inside and got myself a jacket, but I didn't want to get too excited. I also debated stretching my luck and making a coffee before I left, but that still scares me a little. I have missed my coffee so much, but just like my pregnancy with Quinn, it sounds like the least appealing thing ever. But bringing Pumpkin Spice Latte's into the picture is a whole different story! I put together a little Fall Bucket List for this year which I fully intend on printing out and putting in my kitchen because if it stares us in the face everyday, we are more likely to make it happen, right? I'll be updating it as things get crossed off (hopefully). Step 1: Buy a fire pit. Because it's kind of hard to make s'mores in a firepit without one. Anyone else so excited for fall? And dark nail polishes and cozy scarfs? Yes Im so excited too! 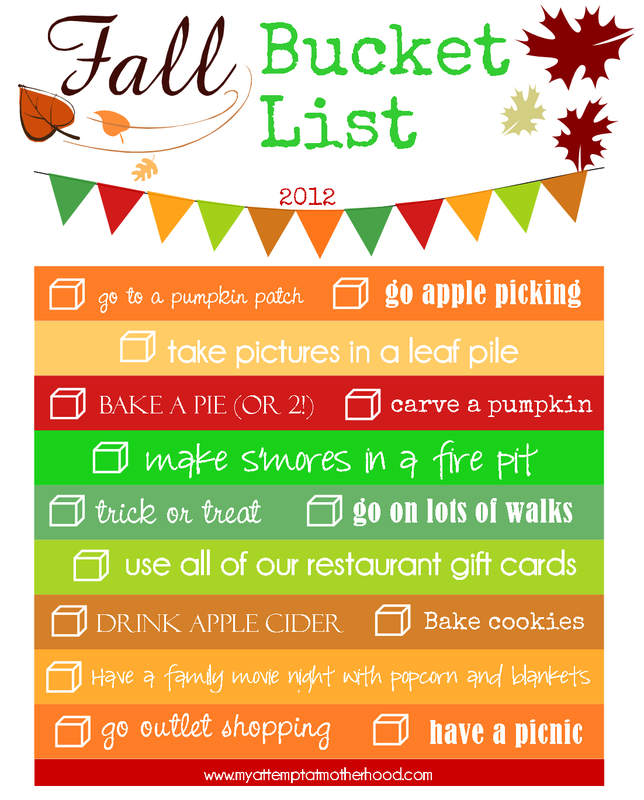 I saw a bucket list like this on pinterest so I wanna make one too! Here in GA was breezy and low 70s this morning and all sunshine! Gorgeous fall-ish day! Oh I am SOOO ready for fall. Yep, can't wait for fall! Love your list. The s'mores on the fire pit sound delish!! !